If you have ever driven through the center of Florida, you’ve probably seen cows grazing or resting under shade trees. These cows were almost certainly being raised for beef. Although the horrible final destination for dairy cows is the same as with beef cattle—the slaughterhouse—dairy cows in Florida spend much of their lives on concrete, confined in overcrowded and disease-ridden farms. Dairy farming is one of Florida’s biggest animal industries, second only to the beef cattle industry in dollar value. For decades, the number of dairy farms in Florida has been in decline, while the size of herds on individual farms has increased dramatically. Today, most dairy farms in Florida have between 500 and 1000 cows, and several huge mega-dairies have over 3000 cows! The lives of dairy cows are a bleak cycle of pregnancy, birth and milking to provide one thing—milk for human consumption. The heat and humidity of Florida’s climate makes life difficult for dairy cows. Florida’s hot and wet conditions also increase health problems such as mastitis, a common but serious bacterial infection of the mammary gland. In an attempt to fight the heat, and to better control waste, farms confine cows in warehouse-sized buildings that have giant fans running 24 hours a day. But confining cows creates other problems. As a result of standing on concrete, and from lack of exercise, dairy cows commonly suffer from painful feet or leg injuries. 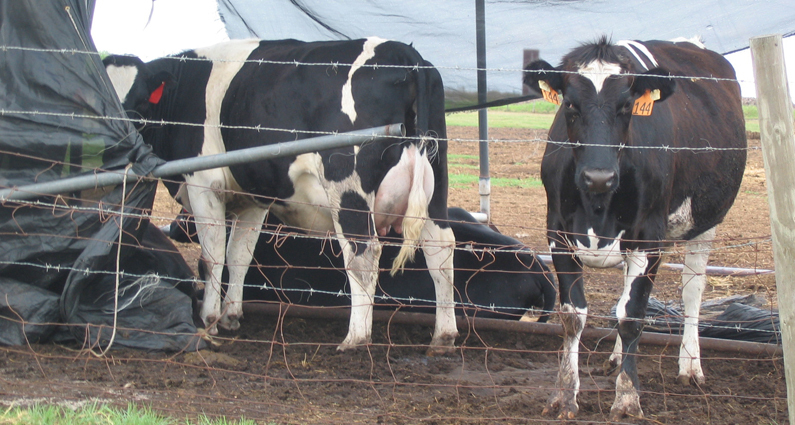 Lameness is one of the most frequent reasons that dairy farmers kill cows. Like other mammals, cows have to give birth in order to produce milk. 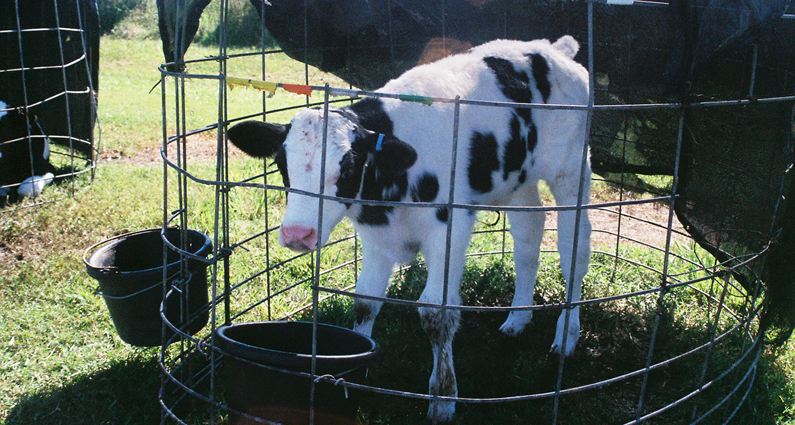 Immediately after giving birth, the dairy cow’s calf is forcibly taken from her and fed artificially. Male calves are of little value to the dairy industry, so dairy farmers sell them to the notoriously cruel veal industry (there would be no veal without the dairy industry! ), or just abandon them at the farm. In 2000, workers at a dairy farm in Okeechobee were caught on film dumping day-old calves in a pit, and shooting them with a pistol. Young female calves are moved into tiny, individual pens where they spend the first weeks of their lives, cut off almost completely from contact with other cows. A strip of fabric serves as shade. Farmers claim that they must isolate calves to protect them from infectious disease, noxious ammonia and other threats to young animals that are common in modern dairy farms. Before a calf leaves the pen, she will be dehorned, a painful and stressful mutilation, usually conducted without anesthesia (farmers explain that dehorning reduces injuries in the crowded dairy). Before the calf turns two, she will be artificially inseminated and begin her “productive life.” Cows are milked twice, even three times per day, and are pushed to produce as much as 20,000 lbs of milk per year! After a few short years, a cow’s milk production declines and she is sold for slaughter. Cows are also killed if they have difficulty getting pregnant, or due to chronic mastitis or lameness, anything that makes her no longer profitable. A cow’s natural lifespan is 25 years or more. 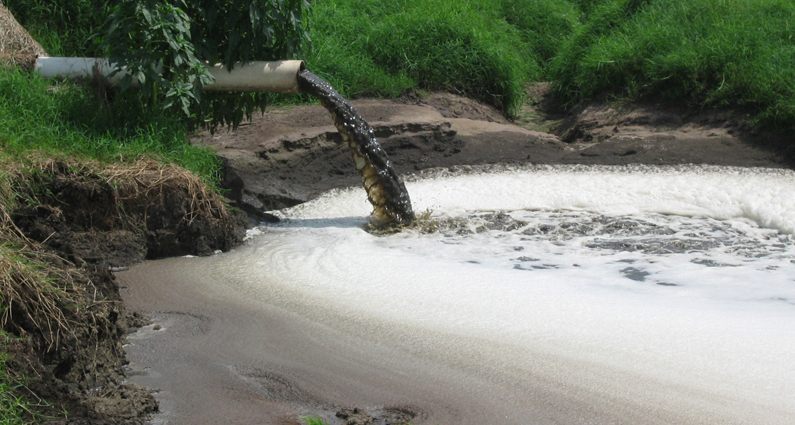 The amount of wastewater and manure produced on dairy farms is astounding, and inevitably pollutes rivers, lakes and groundwater. Our bodies need the mineral calcium to build and maintain bones and teeth. But cow’s milk is not the best or a necessary source. Plant foods can provide all the calcium and other nutrients we need. The most healthful calcium sources are fortified orange juice or non-dairy milks, beans, instant oatmeal, broccoli, and green leafy vegetables such as collards or kale. Cow’s milk is high in calories, fat and cholesterol, and frequently contains antibiotics, hormones and other drug residues. Millions of Americans are dairy (lactose) intolerant. The only beings suited to consume cow’s milk are infant cows. ARFF recommends that people wishing to reduce animal suffering minimize or, better yet, eliminate animal products from their diet. Contact ARFF for ideas on how to make the change to a healthier, animal-free lifestyle. Please download and distribute our handout.